Mosaics in the Northern Italian Tradition-Feb.2019-Register now! 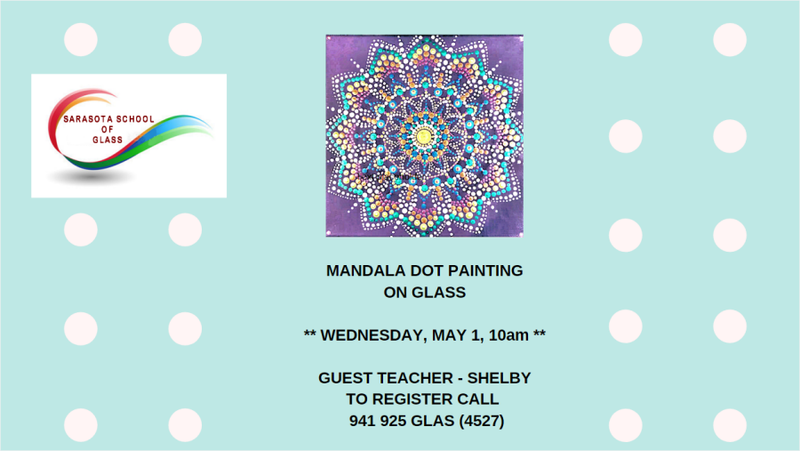 Join us on May 1 from 10am to 4pm for a hands on Dot Painting on Glass Mandala Workshop. No prior painting experience is necessary. Have you ever seen those wonderful images painted with dots forming colorful, beautiful Mandalas? Have you ever wondered 'how do they do that'? In this class you will learn how it's done creating a personal Mandala of you own colors and design. This 8" x 8" fused glass dot painting comes with it's own lucite stand. All materials are included. See you there! Shelby has been immersed in the glass world since the early 1970's in Northern California where she maintains her studio. She now divides her time working in glass between California and San Pancho, Mexico. She began her glass career creating Stained Glass pieces which she sold at Art Fairs. Developing and refining her skills she went on to making Custom Stained Glass Windows. She did this for about 15 years when she read a book on Glass Fusion and dove into that. For the next 15 years she was a Glass Fuser showing her work at many Art Fairs and Art Galleries. After studying and teaching the ancient art of Glass Tile Mosaics in Italy, Greece, and the US, Shelby is currently a Glass Mosaic Artist. In 1999 she was a winner of the very prestigious Corning Glass Museum's 'Neuw Glass Review'. Working with Mosaics , developing new substrate designs. Teaching this wonderful art form continues to fill her life. In the past couple of years Shelby has diversified her art into the 'fun' technique of Dot Painting on Glass. She is the only 'Dot Painter' that paints Mandalas on glass for fusing.